Congratulations to Syntrix scientists on their latest issued patent at the United States Patent and Trademark Office. Abstract: There is disclosed a photocleavable sense-antisense nucleobase polymer complex capable of modulating gene expression comprising an unnatural antisense nucleobase polymer that targets an mRNA, and a photocleavable sense nucleobase polymer noncovalently bound to the antisense nucleobase polymer, wherein the photocleavable sense nucleobase polymer comprises a plurality of nucleobase polymers connected by a photocleavable linkage. There is also disclosed a method for controlling the time and spatial position of gene expression comprising selecting a target mRNA, introducing the photocleavable sense-antisense nucleobase polymer complex into a cell, and selectively irradiating the cell with light. 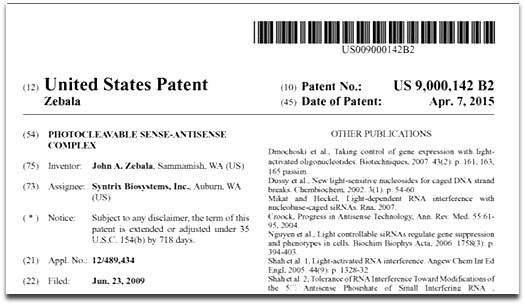 Representative Claim: A photocleavable sense-antisense nucleobase polymer complex capable of modulating gene expression, comprising an unnatural non-photocleavable antisense nucleobase polymer that targets an mRNA, and a photocleavable sense nucleobase polymer noncovalently bound to the antisense nucleobase polymer, wherein the photocleavable linkage does not block the activity of the activity of the antisense nucleobase polymer, wherein upon light irradiation the photocleavable linkage moiety cleaves and bisects the sense nucleobase polymer into two halves, wherein the binding stability of the two halves of the sense cleaved nucleobase polymer is significantly reduced relative to that of the intact sense nucleobase polymer, wherein upon cleavage the two halves of the sense nucleobase polymer dissociate from and release the antisense nucleobase polymer, and wherein the released antisense nucleobase polymer initiates knockdown of the target mRNA.